Due to Christmas, the Divisional playoff games were held in a span of three days. The AFC playoff games were played on Saturday December 24 while the NFC games were held on Monday, December 26. It also marked the only year since the AFL–NFL merger in 1970 that one conference held both of its divisional playoff games on one day and the other conference held both of its games on the other day. In every other season since 1970, the conferences have split their playoff games over the two days. On a play that became known as Ghost to the Post, Raiders quarterback Ken Stabler threw a 42-yard completion to tight end Dave Casper on a post route to set up the game-tying field goal with 29 seconds left in regulation. Casper, nicknamed "The Ghost" by his teammates, also caught a 10-yard touchdown pass 43 seconds into the second overtime period to win the game. The game featured nine lead changes before it was over. The Rams had easily defeated an aging Vikings team in the regular season 35–3 in October on the nationally televised Monday Night Football, and after years of frustrating playoff losses in the cold of Minnesota, the Rams finally had a home playoff game against the Vikings. In addition, Viking quarterback Fran Tarkenton was injured in that Monday night game. 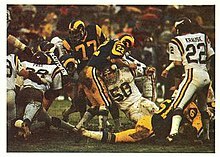 However, as luck would have it, Los Angeles was engulfed in a torrential rainstorm, and the game became known as “The Mud Bowl”. Running back Chuck Foreman led the Vikings to a victory by recording 101 rushing yards on the heavy field. Minnesota head coach Bud Grant’s strategy was to have quarterback Bob Lee throw early before the field lost traction. By the end of the game, the Rams lost three turnovers, while the Vikings didn't lose any. From that point on until the fourth quarter, both teams remained scoreless while the field turned into a quagmire. The Rams had two chances to score, but quarterback Pat Haden threw an interception to Nate Allen in the end zone and kicker Rafael Septién missed a field goal. Early in the final period, Vikings running back Manfred Moore returned a punt 21 yards to set up Sammy Johnson's 1-yard rushing touchdown. With less than a minute left in the game, Haden threw a 1-yard touchdown pass to Harold Jackson to cut the score 14–7. The Rams then recovered the ensuing onside kick, but safety Jeff Wright intercepted Haden's desperate pass in the end zone on the game's final play. 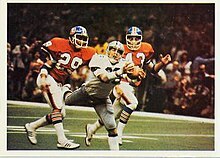 The Broncos' famed Orange Crush Defense stopping a Raiders offensive play in the AFC Championship Game. Moses was responsible for most of Denver's 217 yards gained through the air, finishing the game with 5 receptions for 168 yards and two touchdowns. Morton completed 10/20 passes for 224 yards and two touchdowns, with one interception. Stabler finished 17/35 for 215 yards and two touchdowns with one pick. Garrett returned 3 kickoffs for 111 yards and two punts for 5. The Cowboys defense held the Vikings to 214 total yards, 66 rushing yards and 6 points, while forcing them to lose 4 turnovers. Minnesota again started quarterback Bob Lee, who was playing for the injured Fran Tarkenton. Dallas took the early lead after defensive end Harvey Martin recovered a fumble from Vikings running back Robert Miller on the third play of the game, giving the Cowboys a first down on the Minnesota 39-yard line. Following 7-yard run by Robert Newhouse, Dallas scored on Roger Staubach's 32-yard touchdown pass to receiver Golden Richards, giving the team a 6-0 lead after Efren Herrera missed the extra point. Later in the quarter, Minnesota had a big chance to score when a Dallas punt back near their goal line gave the Vikings a first down on the Dallas 45-yard line. But this drive was snuffed out by defensive lineman Ed "Too Tall" Jones, who stormed into the Vikings backfield to tackle running back Chuck Foreman immediately after taking a handoff, forcing a fumble that was recovered by Martin. In the second quarter, Dallas took advantage of a short field after Butch Johnson returned a punt 4 yards to the Vikings 46. The team then drove 46 yards in 8 plays, including a 14-yard run by Danny White on a fake punt, to score on Newhouse's 5-yard rushing touchdown. Vikings receiver Sammy White returned the kickoff 37 yards to the 48-yard line. On the next play, a 44-yard pass interference penalty on Charlie Waters gave Minnesota a first down on the Dallas 8. But after Foreman was stuffed on two running plays, defensive tackleRandy White sacked Lee on the 16-yard line, forcing the Vikings to settle for a 13–3 deficit from Fred Cox's 33-yard field goal. Then after forcing a punt, Lee completed passes to Stu Voigt and Sammy White for gains of 19 and 16 yards as the team drove 68 yards to score on Cox's 37-yard field goal, making the score 13–6 with less than two minutes left in the half. Dallas struck back with a 32-yard completion from Staubach to running back Preston Pearson setting up Herrera's 21-yard field goal, giving the team a 16–6 lead going into halftime. Minnesota mounted a mild scoring threat early in the third quarter when a 28-yard completion from Lee to White gave them a first down on the Dallas 34, but they could go no further and ended up punting. Near the end of the quarter, Dallas had a huge chance to increase their lead with a drive inside the Vikings 15-yard line. But Minnesota safety Jeff Wright forced a fumble from Tony Dorsett that was recovered by linebacker Fred McNeill. In the fourth quarter, Cowboys linebacker Thomas Henderson forced Vikings punt returner Manfred Moore to fumble and it was recovered by Dallas tight end Jay Saldi. Five plays later, Dorsett rushed for an 11-yard touchdown to put the game away. During the first quarter, a fan in dressed in a snowman suit, 24-year old Daniel Yoder, was accidentally set on fire when he bumped into a flaming can of liquid fuel being used by a girl selling hot chocolate in the stands. Yoder was completely engulfed in flames, but other spectators managed to put out the fire and he survived with second-degree burns.